In a world of business professionalism and an endless stream of black tie and jacket affairs, it can be pretty tough to look great, fit in, and still stand out. It is important to be able to express your own personal style and how can anyone expect to do that if you're wearing the same look as every other guy in the office over the last decade!? Of course, you can include a little secret personalization... cuff links and super socks. Great options! Or you could go to the next level! Imagine an entire suit that is styled right after the thing that makes your heart beat the quickest. Picture walking into the room and stunning everyone as if they were hit by a telepathic wave. Just think of their gaze stuck on you just as fast as if they'd been captured by a surprising and carefully engineered net. It's time to show up in marvelous style! Well, you might not have to actually head off to an alternate dimension to get the amazing look you're after. 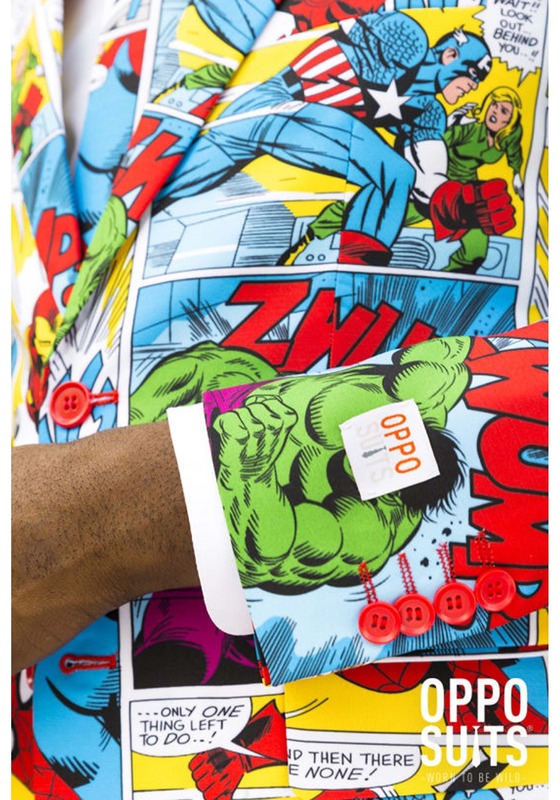 Just enjoy slipping into this Men's OppoSuits Marvel Comics Suit! This suit has everything you need for a heroically dashing look. The suit jacket is fully lined for comfort and has a two-button closure as you'd expect. 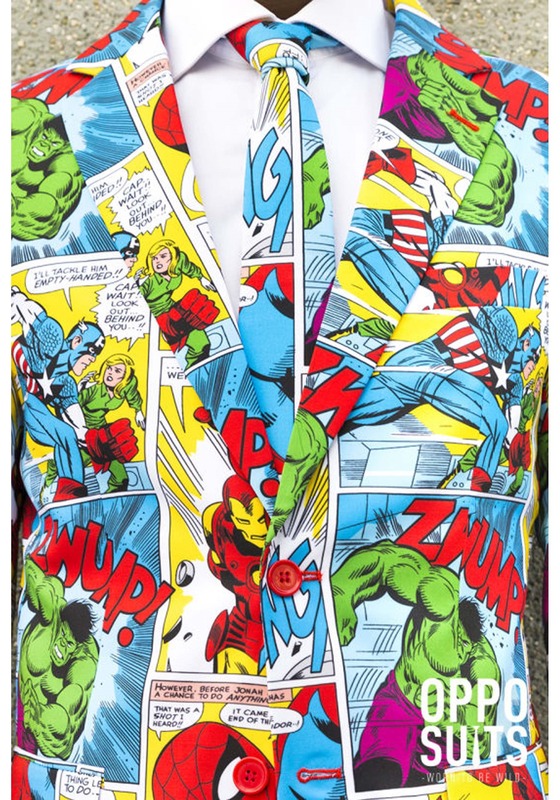 But, the all-over look features a four-panel comic book illustrated style with all your favorite Avengers characters. The matching necktie and pants will have you blending into the heroic landscape just like you know you belong there. 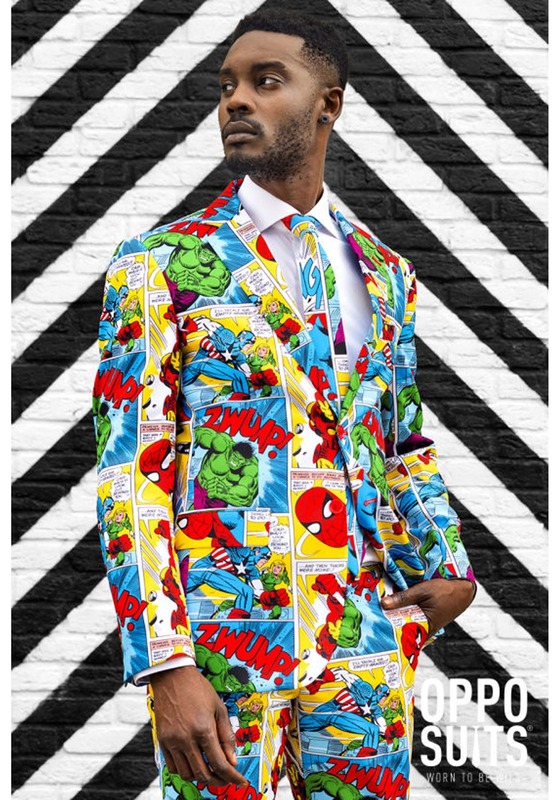 You can be sure that you will never show up to an engagement again in the same suit as anyone else when you gear up with your Marvel friends in this OppoSuits Marvel Comic Suit. Then again, if you did run into someone else in this style, you know you're about to start up a hero team of your own!